BRISTOL - Gavin Greger left the field Thursday evening dismayed and discouraged. After watching Bristol Central baseball teammate Sean Wininger pitch a six-inning shutout, Greger came on in relief in the seventh inning of a scoreless game against Hall. He then proceeded to hit a batter, throw a wild pitch and surrender a walk-off single in a 1-0 heartbreaker. He was disheartened afterward and some of those emotions even spilled over into Friday morning. But Greger didn’t have much time to sulk. Rams head coach Bunty Ray made it clear he was going to turn right back to the freshman southpaw as soon as he got the chance. Greger’s own resilience and his coach’s belief in him paid off in droves Friday night, as he came on in relief of Rams starter Alec DiLoretto to toss five innings in which he allowed no runs, one hit and fired seven strikeouts against six walks in a 5-0 Bristol Central victory over Newington. After an infield single and stolen base by Austin Brown began the top of the first for the Rams (3-1), DiLoretto pounded an RBI double to left-center for a 1-0 lead. But DiLoretto, one of the Rams’ most reliable arms, has been battling a pulled quad, and Ray knew he was only going to get 40-50 pitches out of the righty. The senior threw two innings before walking Ryan Saindon and allowing Ethan Errera to draw a 2-0 count to start the third inning. In the middle of the at-bat, Ray called in Greger from center field to replace DiLoretto, and he shined. Eventually. After throwing nine of his first 10 pitches for balls - including six straight for back-to-back walks - to load the bases with no outs, Greger worked his slider and curveball to for two consecutive swinging strikeouts and a pop out to second. From there, he was lights out. “[Thursday] was a tough one,” Greger said. “We lost a 1-0 game, but I had my teammates behind me today. They kind of helped me through last night, and they had my back all through today on offense and defense making plays. I think my team had a big part in me being able to come back strong and help us get the win. Greger admits he may have been a little more fired up than usual as he relished the opportunity to bounce back from Thursday night’s loss. In the bottom of the third, the Indians (2-1) saw their deficit increase as Nick Ruffino’s line-drive single scored two after an error in left field allowed a second run to score. Peyton Clark then laced an RBI single to left field for a 4-0 lead. 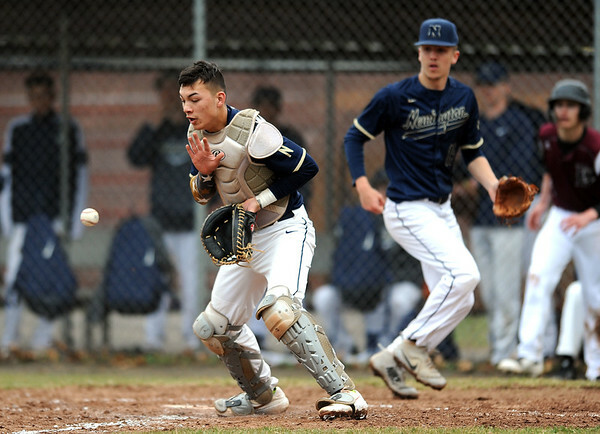 The Rams added their final run in the fifth on an error, as Newington’s shortstop mishandled what would have been an inning-ending double play with runners on the corners. Greger also worked around putting runners on first and second in the fourth inning by tossing a beautiful curve to the outer third of the plate for a swinging strikeout against Errera, one of the Indians’ top hitters, to end the threat. Greger also allowed runners to reach first and second with no outs in the seventh, but the freshman remained composed. He rung up two straight looking strikeouts on Gunnar Johnson (a righty) and Jack Kelley (a lefty) on an outside curve and an outside slider. Alaimo was impressed with Greger, whom he believes could be a star down the road. “I told Bunty going into the seventh, ‘This kid’s really good.’ I love his composure,” Alaimo said. “He did a phenomenal job as a freshman. He came in and threw strikes. He mixed [his pitches] very well. He has a nice slider and curveball. He got some key outs when he needed it, which is super impressive from a kid who’s 14-15 years old facing a really talented team that I think we have here. Posted in Newington Town Crier, Newington on Friday, 12 April 2019 22:36. Updated: Friday, 12 April 2019 22:38.